Talent acquisition and retention has evolved greatly in the last few years, turning from a tactical process to a strategic operational area that has a direct impact on organizational growth. We consider it even more crucial, because it affects not only Auriga’s growth and wellbeing but, more importantly, our ability to provide our clients with the resources required to address the challenges they face. Being highly interested in the topic, we have recently conducted our own survey on current trends in software engineering talent acquisition and retention. With the assistance of LTM Research, an independent research company, we gathered and analyzed the opinions of HR professionals from 51 US-based software engineering companies. 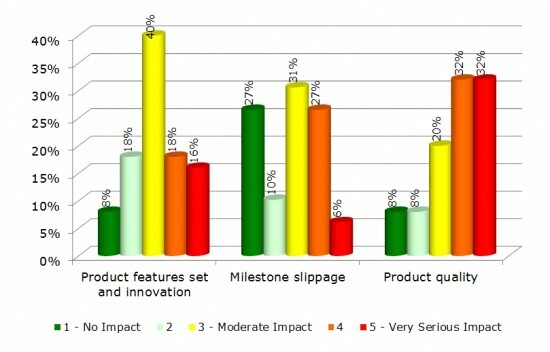 We are pleased to share the key survey findings and insights with you. Software talent acquisition and retention is of great importance to the majority of our respondents, and it comes as no surprise. According to the HireRight 2015 Employment Screening Benchmark Report, finding, retaining, and/or developing talent is the #1 business challenge for most employers. Approximately 60% of companies we surveyed currently have open software development positions, and 37% of employers plan to hire more new staff members than last year. Companies are willing to hire talent, and the number of vacancies is projected to grow steadily. But hiring is not that easy, however. More than half of our respondents declared difficulties in staffing engineers, and the majority of them agreed that competition within the industry is only increasing. Other challenges include potential candidates’ flow-out to other industries and locations as well as the lack of up-to-date educational programs and graduates with actual engineering skills. Moreover, recruitment is usually a time-consuming process. It typically takes 1-2 months to fill a junior- or mid-level software engineering position requiring less than 5 years of experience. But when it comes to senior-level and project management positions, it takes about 3-6 months according to 30% of the companies that participated in the survey. Technical, communication, and collaboration skills are, predictably, the top characteristics sought when hiring new engineering talent. Analytical and design skills, as well as previous experience in the business domain, are also appreciated by most recruiters. The survey showed that up to 25% of engineers leave the company 1-3 years after being hired, and 70% leave in less than 5 years. Only 8% of developers stay with a single company longer than 10 years. So, what affects employee retention most? 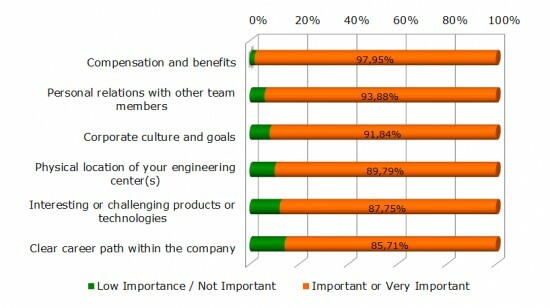 According to our respondents, raising salaries is still the #1 way to retain engineers, but money is not the only factor. Personal relations with other team members and corporate culture are also very important aspects emphasized by over 90% of employers. Despite their hiring efforts, 93% of companies stated they cannot fill all open positions in time. 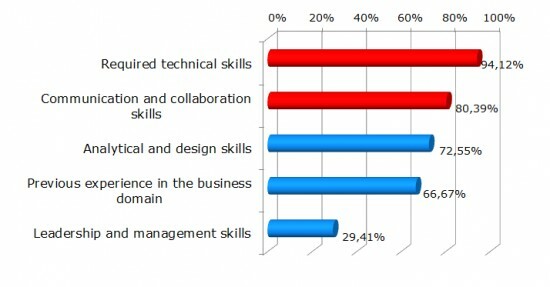 Interestingly, many other studies confirmed that availability of skills has become a serious concern. The 2015 Talent Shortage Survey by ManpowerGroup, for example, reveals that 38% of employers on average report having difficulty filling jobs due to a lack of available talent. The impact of unfilled and later-than-needed-filled software engineering positions on business operations is often harmful, and product quality suffers most. According to the 17th Annual Global CEO Survey: The talent challenge by PwC, 93% of CEOs recognize the need to change, or are already changing, their strategy for attracting and retaining talent. Outsourcing is a viable option to get access to new talent pools for building your software development team and stay ahead of the competition. “The situation on the IT labor market nowadays is a far cry from what we witnessed, say, ten years ago. The explosive growth of new technologies has led to the increase of new start-ups, challenging projects and promising initiatives. The seeking and hiring of new employees is now a full-time task, not a part-time effort. A carefully selected software services provider is a way to reduce your pain and expenses and let you focus on your business goals. This outsourcing vendor is a great asset to handle harvesting the labor market, screening and hiring the right experts, managing the engagement and promptly scaling the team up and down. Auriga performs sophisticated, innovative projects requiring complex computations and scientific-intensive software development based on deep academic knowledge and creativity. We are well aware that our continued success depends on our ability to attract and retain talented, highly skilled, and motivated people.